The quantitative estimation for the interpolation error constants of the Fujino–Morley interpolation operator is considered. 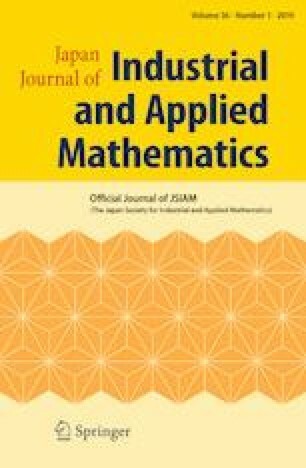 To give concrete upper bounds for the constants, which is reduced to the problem of providing lower bounds for eigenvalues of bi-harmonic operators, a new algorithm based on the finite element method along with verified computation is proposed. In addition, the quantitative analysis for the variation of eigenvalues upon the perturbation of the shape of triangles is provided. Particularly, for triangles with longest edge length less than one, the optimal estimation for the constants is provided. An online demo with source codes of the constants calculation is available at http://www.xfliu.org/onlinelab/. The authors would like to thank for the support from the Ministry of Science and Technology, Taiwan, ROC under Grant nos. MOST 106-2115-M-006-011, MOST 107-2911-M-006-506. This research is also supported by Japan Society for the Promotion of Science, Grand-in-Aid for Young Scientist (B) 26800090, Grant-in-Aid for Scientific Research (C) 18K03411 and Grant-in-Aid for Scientific Research (B) 16H03950 for the third author.